By riding atop mail sacks carried on airmail routes, air passengers in the early 1920s pioneered the first passenger airlines. In single-engine biplanes such as the Boeing Model 40 and Douglas M-2, these early flyers couldn't imagine that by the end of the next decade millions of people would be flying from one end of the United States to the other and that the dawn of international air travel would be well under way. A giant leap in technology would make air travel safe, convenient and reliable. Amazingly, this advance would take place during an economic depression unlike any the United States had experienced. It would come about primarily through the efforts of two companies: The Boeing Airplane Company and Douglas Aircraft Company. In early 1933 Boeing introduced the world's first modern passenger transport, the Model 247. This all-metal, twin-engine monoplane with retractable landing gear sported a streamlined design. It could carry 10 passengers comfortably and safely, and it cut the coast-to-coast flying time from about 28 hours to 20 hours. Because Boeing had built the 247 for United Airlines, part of its United Aircraft and Transport Corporation, Boeing wouldn't sell the plane to United's competitors until United had received all it wanted. This restriction created the opportunity for Douglas Aircraft to enter the passenger airplane business. Douglas designed its DC-1 as a single prototype built for Transcontinental and Western Air. Like the 247, the DC-1 was a twin-engine monoplane, but it was larger and faster and could carry 12 passengers. In 1934 it set a new coast-to-coast record of 13 hours 4 minutes. 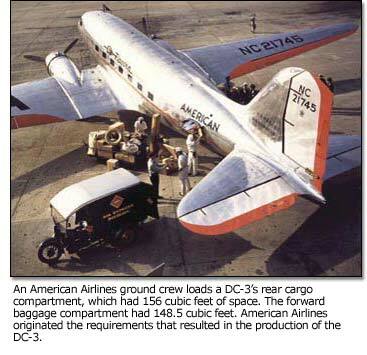 TWA quickly ordered 25 production aircraft under the designation DC-2, which could carry 14 passengers. At the request of American Airlines, Douglas began work on a larger airliner: the famous DC-3, which made its first flight Dec. 17, 1935. The DC-3 could carry up to 28 passengers, could fly more than 1,600 miles without refueling and proved extremely economical to operate. American Airlines president C.R. Smith said the DC-3 was the first airplane that could make money for an airline by hauling passengers, without relying on government subsidies to stay afloat. By 1939, more than 90 percent of the nation's airline passengers were flying on DC-2s and DC-3s. United Airlines, now separated by government decree from United Aircraft and Transport Corporation, began ordering DC-3s as well. In 1936 Pan American Airways wanted an airplane with sufficient range to cross the Atlantic Ocean. Boeing responded with the Model 314 flying boat, dubbed the "Clipper." Able to carry 74 passengers, the four-engine Model 314 was the largest passenger airliner of its time. It made its first flight in June 1938 and entered service a year later. Travelers enjoyed a comfortable passenger cabin that featured sleeping berths for 40, large windows, separate dressing rooms for men and women, a dining salon that could be turned into a lounge, and a well-stocked bar. In the mid-1930s, engineers at Boeing began to tackle the problem of how to fly over bad weather that delayed flights and disturbed passengers. In 1938 the company introduced the four-engine Model 307. Its pressurized cabinan industry firstallowed the 307 to fly as high as 25,000 feet, above most storms and turbulence. Because of its high-altitude performance, the Model 307 was given the name Stratoliner. It entered service with TWA and Pan American in 1940. By this time, war clouds had gathered over Europe and Asia, and commercial transport development would stall until peace returned.